Wireless Charging: The Future Of Gadgets Without A Power Cords? Not So Fast : All Tech Considered This month, the first wireless-charging laptop hit the market. But making wireless power a standard consumer feature is a big technological — and psychological — challenge. 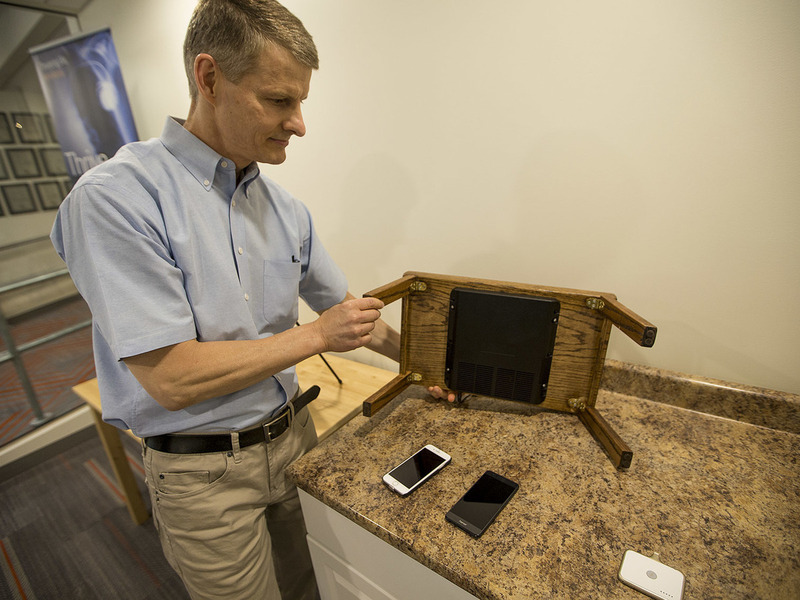 Morris Kesler, chief technology officer at WiTricity, shows how a wireless charging pad can be installed on a table. It's an appealing future — powering up your gadgets without all those annoying charging cables. Researchers have been pursuing this future for years. Samsung has been integrating wireless charging into Galaxy phones. Apple is reportedly planning for wireless charging for its next iPhone. And this month, Dell released the first laptop that can be charged wirelessly. Some experts say wireless power could transform consumer electronics as much as Wi-Fi or Bluetooth technologies have. But making wireless power a standard consumer feature is a big technological — and a bit of a psychological — challenge. If you pop into a Starbucks in Boston, you might notice little circle power mats on the table. They're for charging your cellphone, specifically the Samsung phones that came out after 2015. You place the phone on the mat and it powers the phone without the need for a wire. Borui Lee has one of those Samsung phones, sitting on one of the power mats. But if you ask him how often he uses one of these pads, he starts laughing. "Like zero!" he says. "I come to Starbucks like maybe once a month and I use it if I have my phone there." Lee says when he first bought his phone, he was so excited about the wireless-charging feature that he bought a personal power mat. But then: "I used it for about three months before going back to my wired charger." Lee's complaint is time. He says it feels like charging with the wire goes double the speed — plus, his phone came with a rapid-charging wire that works even faster. At the Starbucks, he says his phone has been on a power mat for about an hour and charged up by only some 20 percent. A tech company called WiTricity says it is developing wireless power that is faster than what you see at Starbucks. WiTricity spun out of MIT about a decade ago and has collaborated with Dell on a new laptop, called the Latitude 7285, that charges wirelessly through magnetic resonance technology. "The power source, which is the pad that the laptop sits on, creates a magnetic field that the laptop uses to charge," WiTricity Chief Technology Officer Morris Kesler explains. He says the mat charges the laptop just as fast as a traditional power cord, but here's the catch: Even though you can ditch the power cords for the laptop, the charging mat still has to be plugged in to function. So you can't exactly wirelessly charge on the go. "The idea is you might have one of these on your desktop," Kesler says. "You might have one in a conference room where you just put your device down there and it charges. You might have one at home. ... The convenience is, I don't have to worry about plugging and unplugging and carrying an adapter with me." This, of course, adds up: Each mat costs $200. Dell's Kelli Hodges says the new laptop is a specialty product for now, catering to workplaces more than general consumers, helping Dell assess the market. "I would say for it to become part of the mainstream of what we're doing, I think you're looking at probably two years out," she says. WiTricity's Kesler says the Dell laptop is just the beginning. He imagines this Utopian future where wireless charging is all around us. You drive your electric car into a garage, where wireless charging pads are on the floor. You open the door to the house and throw your cellphone on the kitchen counter, where wireless charging tech is built into the countertops. That future is still far off, though the new laptop could be an important step for the industry, according to IHS Markit analyst David Green, who covers the wireless power sector. In 2016, just under 240 million devices with wireless charging capabilities shipped worldwide, he says. "But growth can be massive," Green adds. "By 2025, you'll be talking over 2 billion devices a year will ship with wireless charging." The biggest challenge, Green says, will be to persuade people to give the new technology a try. "There's a bit of a chicken-and-egg situation, whereby a consumer doesn't really want to know about something convenience-based because they feel what they do right now is fine," he said. "When people do start using it, they love it. So the difficulty is getting it into that first use." Back at Starbucks, Lee says despite his preference for the fast-charging wire, he believes that people will want wireless charging. But what he really wants is portability — not something built into a table, but something he can carry with him — essentially the freedom to charge wherever, whenever. There is a California-based company called Energous that is working on exactly this problem — essentially Wi-Fi charging. "We expect transmitters to be in the market late this year, early next year," said Steve Rizzone, CEO of Energous. "What we're talking about is sending power 2 to 3 feet from the transmitter ... completely wire-free." Rizzone didn't specify any clients, but he insisted Energous has more interest than it can support. Still, Wi-Fi charging isn't readily available in any consumer products. For now, it remains sci-fi.